Move over Time Magazine. 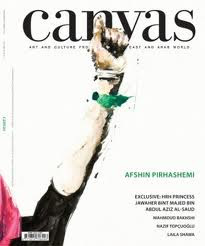 Today, the most influential magazine cover in the Middle East is Canvas! The magazine's cover is the actual "canvas" of the magazine: a decision which the editor and close friend Ali Khadra painstainkingly makes every month. Which art, or artist becomes the laureate? In the Letter to the Subscriber, which is the first thing I read when I get the magazine, Ali writes that "choosing the cover of Canvas is always a difficult process". No doubt, he knows the ramifications of publishing the image of the artist. 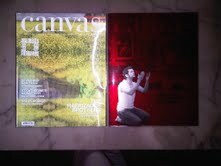 Art buffs in the Middle East understand the notoriety an artist receives after winning the cover of Canvas. The prices of art often rises once its artist is published on the cover of this magazine. 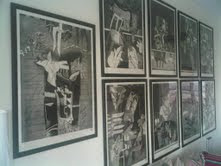 This month, the cover is dedicated to Iraqi artist "Dia Azzawi", who has painted "The Massacre of Sabra". Ali Khadra had wisely remarked that this painting is the Guernica of the Arab world. A few weeks ago, he had even given me a hint of a preview by stating that "this issue is quite special". In special I soon found out he meant politically engaged. In the French system, we used to debate "art for art" or "art as a tool". I can sway either way, but it is nice, and cool (to use a contemporary expression), to sway to the political sometimes, to remember where we come from and what Middle Eastern art is really about. Very few Contemporary Lebanese or Palestinian artists distance themselves from the "war" and the Iranian artists are also becoming vehement in their political expression. Indeed, Middle Eastern art very often represents the voice of a war torn generation. I was impressed to see that the same etchings by Azzawi from the cover, which I recognized as pieces owned by close relatives, were from the same series as ones found in the new Arab Museum of Art in Qatar. They purchased their collection a few years ago, with the certainty that this Guernica portrayal by the artist, whose colorful and immense sculpture also adorns Emirates Towers galleria, is a part of their heritage, no matter how tragic. I then decided to review my personal collection of Canvas issues, as I often do, but this time, just by examining the covers. In this specific instant, you can actually judge the book by its cover. Before I begin my thematic study, I must give special credit on the actual material of the cover! If it were feasible, I think Ali Khadra would publish the cover, "on canvas". He has gone out of his way to use the best materials: the highest quality of paper and the largest variety within those high standards. I am quite aware of the quality of the grain for having visited the print shop where the actual Canvas magazine is assembled. My son was fortunate enough to take his class and curious mother there on a field trip, all courtesy of Canvas. I will point to the Ghutra issue (v.4 issue 4) with the Essa cloth to sign the Canvas Cover title; the Anish Kapoor Islamic Mirror (v.5 issue 3) glossy and mirror like, the avant-guard feminine fuschia and royal 5th anniversary (v. 6, issue 1) and the embossed Cutting Edge Issue II (v.6 issue 3). It goes without saying that I have my top favorites and I think my choice is widely shared amongst readers: the successive v.5, issue 5 and v.5, issue 6 are stunning! My bias is tremendous however, because the three artists that make these two covers are amongst my very favorite: Reza Aramesh and the Haerizadeh Brothers, all three with whom I have become acquainted personally. How Ali Khadra "imagined" these two covers remains a mystery, and one I must investigate further. In the Aramesh Issue, he has wrapped the stunning photograph in red transparency, with a cut out white transparency to isolate the praying figure (and the limited edition square). Lenticular lens is the technique he chose to incorporate both Haerizadeh brothers in one cover, a very auspicious thing to do for two inseparable brothers! The "trompe l'oeuil" effect is very relevant for these cutting edge artists. 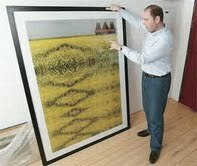 Ramin's kaleidoscopic bed of yellow flowers is a marvelous piece of photography! Impressive in the cover selection, beyond the variety of materials used, is the selection of themes: with the festive Christmas, the entertaining Young Collectors, the avant-guard Cutting Edge (I had to make it redundant), the Anniversaries, the ones that carry the artist's name. Canvas never ceases to impress and surprise. Every month keeps me wondering: how many more issues can be published about Middle East Art? Where will Canvas find its next inspiration? Artists must hold their breath, praying to be discovered, published, and perhaps one day make it to the cover of Canvas Magazine.